vacations, weekends and short breaks for triathletes in the UK, Europe, and Worldwide. Including duathlon, cross triathlon, aquathlon, aquabike, ultraman triathlons and Ironman events. Year-round coached and fully supported triathlon training camps in Amelie les Bains, in Southern France. With personal coaching and custom training plans for club groups and individuals. Camps of various length from a long weekend to two weeks. 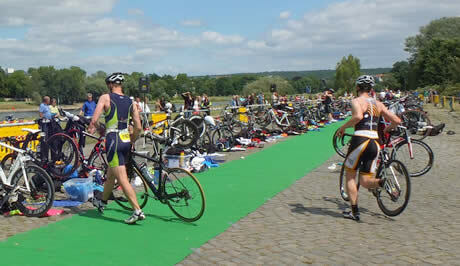 Specialist travel packages for competitors and spectators to Worldwide triathlon, duathlon and Ironman events. Nirvana have been transporting UK triathletes (with their bikes) to major events since 2002. Triathlon training camps in Majorca, hotels provide facilities for training, with heated competition pools, gyms, proximity to trail running routes and surrounded by excellent cycling training terrain. SunTri triathlon training camp provide an expert and highly qualified coaching team with particular expertise both in coaching Ironman and half Ironman distances. Regular training weekend bootcamps in the UK and 1-week distance training camps in Spain, offering plenty of bike, swim and run sessions for all abilities. Triathlon training weeks for all abilities form beginner to pro-athlete. Suitable for individuals, groups, clubs and families. Offering tailored training programmes or structured coached weeks. UK and overseas training camps, offering tri-specific training and coaching camps in Portugal and Greece, staying in 5-star accommodation, and UK triathlon training weekends in Reading. This tailored training covers, video analysis, transition and bike handling skills, coaching with highly experienced coaches. Providing travel packages from the US to worldwide Ironman events (e.g. Brazil, Austria, Hawaii, Florida, Cozumel and Arizona) with included race entry. A holiday venue, designed specifically for triathletes, in the Dordogne region of SW France. The venue has been designed by triathletes and offers accommodation, sports facilities and coaching. 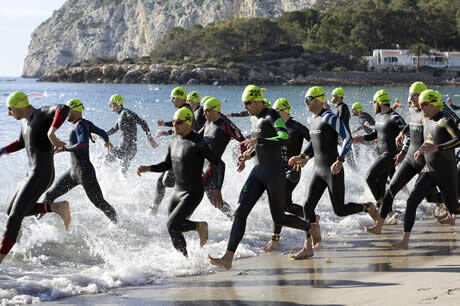 Ironman and triathlon training and cycle coaching in Puerto Pollensa, Mallorca, for athletes of all abilities. Specialist group training camps. Run by triathletes, TriTravel organises travel and accommodation packages for Australian and New Zealand triathlon and duathlon events. Learn to swim, improve your swimming technique or attend a Triathlon Camp, Total Immersion teach an efficient and beautiful swimming technique. Full triathlon coaching and training for all levels including: advanced, intermediate, beginner and improvers. They offer track or trail runs, coached open water swims, and guided bike rides – guests can choose to join these or just use Tri-Topia as a base for their own training holiday. Bike hire can be provided if required. Also well set up for non-training partners, and for families, with heaps of activities for the kids, such as archery, swimming galas, baking, face painting and their own tri training (swim lessons, mini-triathlons and organised bike rides) if they want it. This section lists triathlon camps, residential training courses, coaching and instruction, triathlon event packages, holidays and vacations for triathletes in the UK, Europe, and Worldwide. Includes triathlon weekends and short breaks away. We are also happy to list variants such as: duathlon, cross triathlon, aquathlon, aquabike, ultraman triathlons, and Ironman events. Camps will cater for all abilities (from novice to experienced) and various distances (including Sprint, Olympic or Long distance). Includes event packages for both competitors and spectators. Also see our Extreme Sports section» for triathlon events in difficult environments; and our Running», Swimming» and Cycle training» sections for discipline specific training camps and holidays. The travel-quest triathlon training camps and holidays section listing worldwide camps, courses and holidays for triathletes. See the definition at further up the page for more details.